The South Devon Railway's Routemaster, RM1872, suffered an exhaust manifold failure during the 2014 operating season which meant it was unable to appear for a couple of days at one of our galas. RM1872 has a Scania D9 six cylinder engine which was de-turboed by Scania so the exhaust manifold for cylinders 4, 5 & 6 is a fabrication from stainless steel. 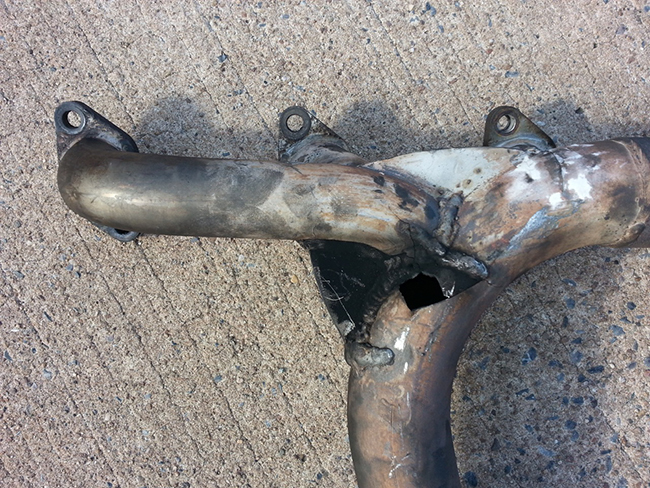 This section also includes the downpipe so has quite a bit of weight on it which is what eventually led to its failure. The manifold suffered from cracking so was getting noisy but the last straw was a piece about the size of a new 10p bit blowing out as the cracks “joined hands” – see picture below. We removed the manifold and had the cracks welded up and a patch put over the hole thereby enabling us to complete the season. 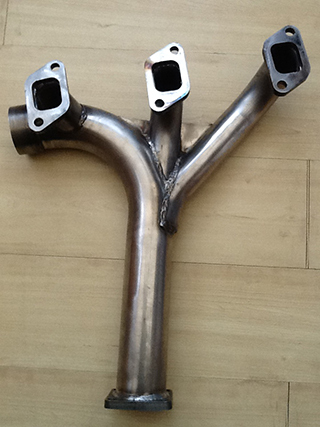 In December the manifold was removed and taken to Guaranteed Exhaust Systems Limited ( GES ) near Cullumpton in Devon. 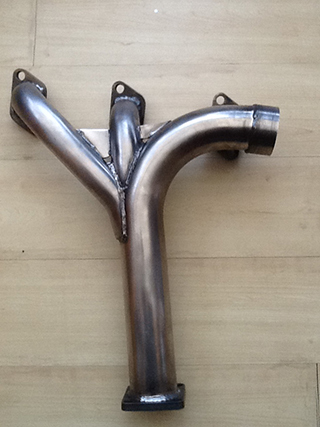 GES make exhaust systems for Aston Martin and Morgan cars so we had every confidence they could produce a replacement for us. The brief was to produce a new stainless steel section to replace the broken item and to take the opportunity to improve the gas flows and hopefully improve accessibility to the fixing bolts. As can be seen from the pictures below the new manifold has achieved the first requirement and gone a long way to achieving the second. The fitting can now be done from the top so no longer needs a long slender arm to get to No 5's lower bolt. Given that the bolts have long and short collars for the stainless steel and cast sections respectively we used a short collar and shortened bolt in the bottom of No 5 to make fitting easier. 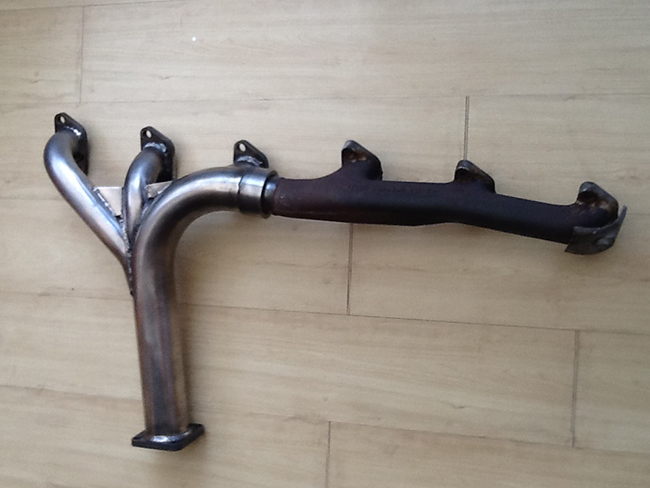 The original downpipe also had a ball joint in the second section. 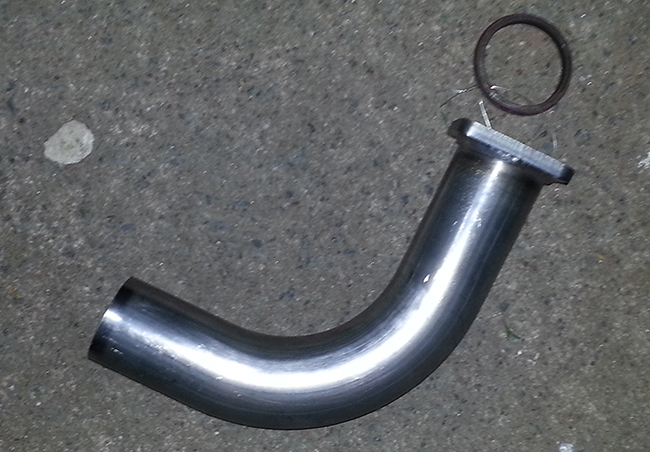 This failed very early on in our ownership and was welded up so the flexible section takes the engine movement. Since we have been unable to source a replacement we asked GES to produce a simple replacement – see picture. 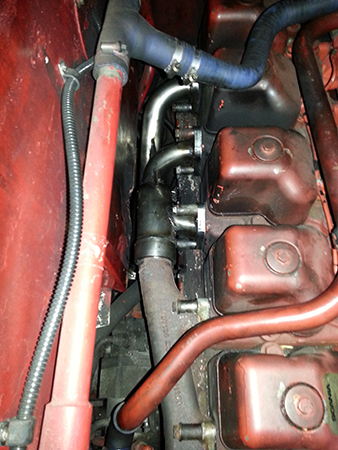 The replacement manifold was refitted with new Scania gaskets and the result is a much quieter cab ! GES have since ceased trading. One of the effects we’ve had was a return of a crack which we suspect is due to vibration and the lack of ball joint so we have had a 100mm long stainless steel flexible welded in just above the flange. This recently ( 2019 ) failed due to the support bracket attachment bolt shedding its nut so all the weight of the tailpipe was being taken on the flexible. We are looking into getting another manifold made before this one breaks again.